The glaze formulating tables developed by Alpine® are designed to eliminate waste and save time and are available in five different sizes. Each table will provide a clean compact working area. No more open sacks of material which might be spilled or broken. A variety of materials are placed at your fingertips. Each full bin tilts out and will hold up to 150 pounds of dry materials, each half bin will hold up to 25 pounds of dry materials. Bins are engineered to open with minimum effort even when completely filled. 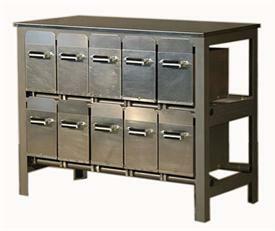 Framework on all five glaze formulating table is constructed of MIG welded steel. 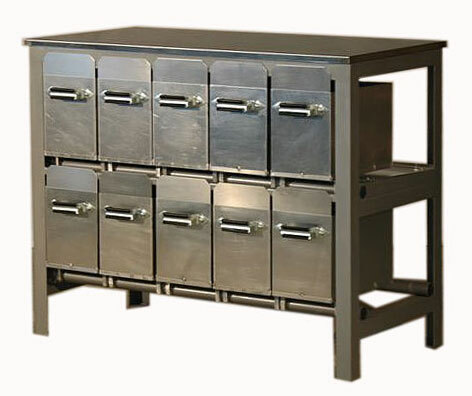 Bins are fabricated of aluminum to eliminate contamination of materials. Tops are stainless steel. NOTE: Model ALGFT8SH is designed for use against a wall. Bins are on one side of the table. Table Area: 8 Sq. ft.
$75.00 Crating/Packing Charge per table from the factory. Sorry!